It is not real clear what manuals apply to the Chevy P30 Chassis so I complied a list to make it easier for everyone. Basically there is a Service Manual and a Component Overhaul Manual. The confusing part is that the P30 chassis is included in the Light Duty Truck manual. It was only in the late 80's that GM moved the P chassis to a seperate manual. 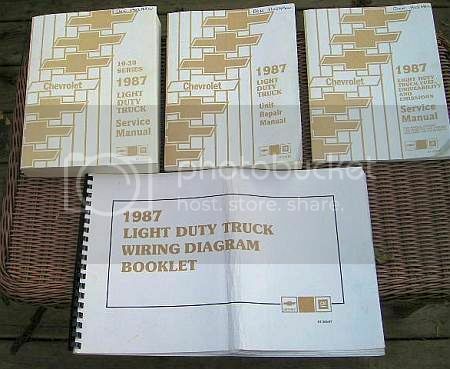 It is also my understanding that, it was not until the late 80's that GM moved the wiring diagrams to a seperate manual. There is a general service manual that provides a world of useful information. It covers mid 70's through 1992. Please be aware that Bisko Manuals does cary some of these on CD-ROM which are a lot cheaper. Both confusing and expensive depending on year. Thanks for posting that info. The ST 376 manual came into existance due to emession controls. Not sure what year they moved the wiring diagrams to a seperate book and I suspect P/N format of the elecrical book changes over the years. I found and purchased the two manuals for the 86 Cheiftan using the given numbers. But the one marked for the electrical ST 350-86 brings up a manual for the Chevette of that year. Is there any chance the number is wrong? Sorry if replying to an old thread is bad form, just wondering if the manuals section is down? I get an error: "The page you requested cannot be found." .. and can't afford the hard copies, especially with the $110 shipping to Australia! You are a charter member, you need to be a paid member to be able to access the online manuals. I can assure you the membership is WAY less than that!!! Once you join up Oz will send you a password and username by PM to get into that area. Send me an e-mail identifying which manual you are trying to download. Go to the members section, scroll down to the manuals and click on the first one that says chevy P30 I think it is and that will open up all of the manuals for that group. Once you get into the manual section and click on the manual that you want it will go to a page that will let you download the manual. You will click on the download link and depending on your browser and computer it will download to your computer in the downloads section. It is usually displayed in some fashion on the screen. Since I do not know what you have I can't help there.